Choosing the best aquarium for the fish you want to keep is an important step. To set yourself up for success it's important to have a good mental picture of what your aquarium will look like when it is finished. Considering the eventual size, temperament, dietary requirements and the colour palette of the fish will help you make informed decisions. Here are some factors that we look at when setting up a new tank. #1 A larger footprint is more valuable than a tank which is very high (tall). The foot print of an aquarium is the area made up by the length and width. We always opt for a large footprint in all of our aquariums. A large footprint makes its more stable than a tall narrow aquarium. This is an important factor when you consider how many earthquakes we experience in New Zealand. A large footprint lets you create a more realistic and natural looking aquascape (placement of rocks, wood and plants). A large footprint allows you to layer the rockwork creating a fantastic three dimensional effect . Creating this natural looking effect is difficult to do when your are dealing with an aquarium less than 550mm or 21". We feel that the best width to height ratio is 700mm 27.5" wide with a water level of 500mm 20". This sizing ratio gives the best possible chance of having an amazing looking aquarium. The best reason to buy an aquarium with a large footprint is that you can keep more fish in it. #2 It`s important to consider the eventual size, temperament and spacial requirements of the fish you plan to keep. Malawian cichlids occur in high concentrations of fish in nature, 10 to 15 fish per square meter. This means we can have higher populations of dominant fish than if we were wanting to house cave spawner's from Lake Tanganyika. 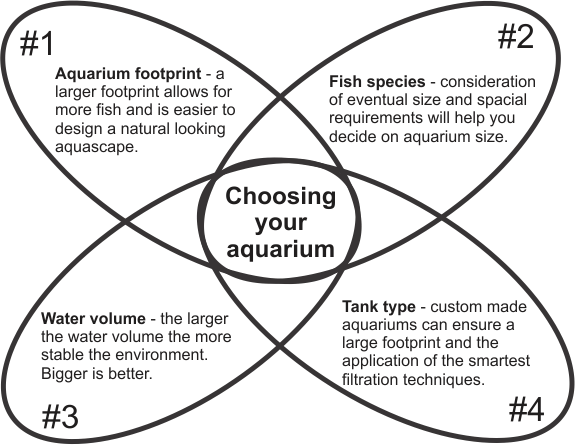 This is an important consideration when deciding on what size of aquarium you will be getting . In our experience, Tanganyikan cave spawners stake out a defined territory and will aggressively defend it and their young, much to the detriment of other fish. If you decide on an aquarium with a large footprint you can keep a colony of Tropheus with the cave spawners. These fast moving fish will keep out of the way of theparents defending their young. Find out more about Tanganyikan and Malawian cichlids. #3 Bigger is better, the larger the water volume, the more stable the environment. Big is good. Think of it this way, a drop of food dye would make a big impact in a glass of water, whereas a drop of dye in a bath tub will have a much less noticeable effect. This is the same for pollutants created through fishes breathing, bodily functions and organic matter breaking down. This is the reason we feel a sump filter are so damn fantastic. It increases the total water volume of your fishes environment. Find out about sump filtration. Now that you have decided on what fish you will keep and the basic size of the aquarium. It`s time to decide on where to get the aquarium from. Most often people will purchase their tank from their local fish shop (LFS). These tend to be nice tidy units with an all in one filter design. In our experience these filter units are sufficient for lightly stocked aquariums with small community fish. They also tend to have small footprints which are not adequate for keeping African cichlids. We supply a range of custom aquariums that use the power of Aquaponics which is the growing of plants using only water and the nutrients found in an aquarium. We aim for a holistic environment rather than borrowing aspects from nature. We can supply and install an aquarium that fits your design style and that will be easy to maintain. Our passion is to create natural looking aquariums that are easy to maintain. Find out more about our custom aquarium setups.